Mid, blue-raspberry flowers with ruffled edges and tangerine beards are stunning, long lasting flowers. Tall clump-forming plants that prefer moist soil. Plants produce huge flat crepe paper-like flowers. Grow in acidic boggy soil near the water's edge. 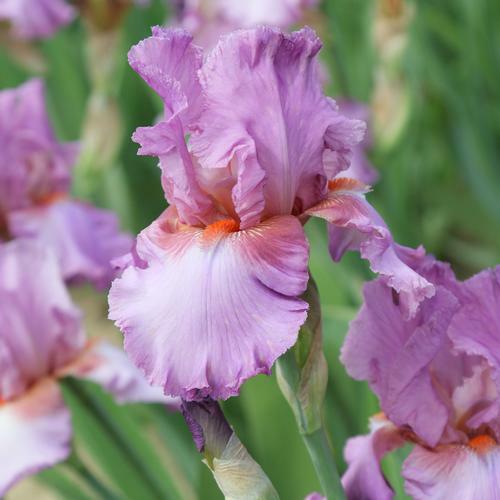 Tall clumping Iris with narrow upright foliage. Plants grow best in moist acidic soil but also tolerates drier soil. Generally pest free. Blooms early summer. Excellent for vertical effect in the landscape. Wonderful spring blooming perennials in a wide assortment of colors. Plants prefer slightly alkaline soil. Plant rhizomes near the soil surface. Drought tolerant. Our plugs have multiple eyes and will finish gallons quickly.